I was inspired by the return of our fan favorite Unimatrix 47 Blog to dive into some Star Trek goodness this week, specifically for mobile platforms. 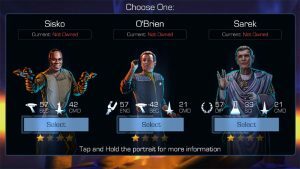 There are actually a couple mobile games with the Star Trek license, but this week I am taking a look at the most established one, Star Trek Timelines from developer Disruptor Beam. It’s available for both the Android and iOS platform, and recently made the migration over to Steam for PC players. 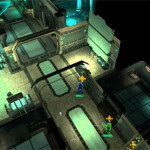 This review was conducted using an Android device, and specifically looks at the game as a mobile title. Many of the coolest features in the mobile version of the game are excellent compared to other mobile titles. However, I would think that even the coolest features like the ship to ship battles, while they sparkle on mobile, might be a little lackluster over on the PC which has access to much greater processing power, and also games with more features. 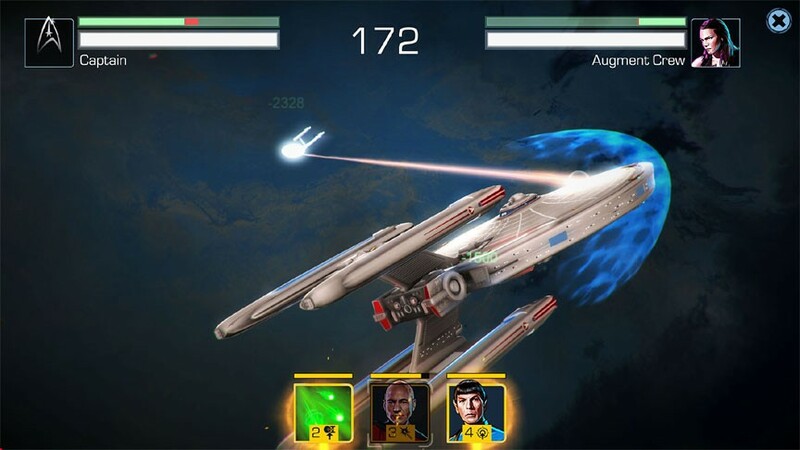 That said, Star Trek Timelines is a pretty impressive mobile game that stands out from the pack. It’s also free to play, and of course supports micro-transactions to speed progress. This review was conducted without making any micro-transactions. 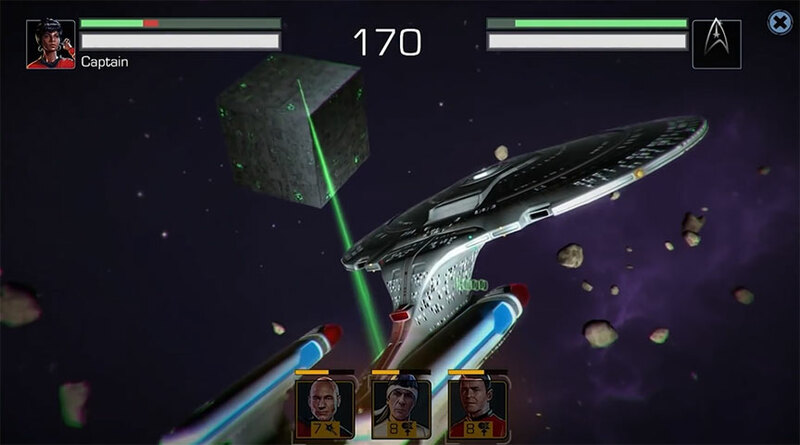 The premise of the game is that there is a temporal crisis in the Star Trek universe which goes beyond rebooting the franchise like the movies did. Something is ripping apart the fabric of space time and you will spend much of your time in the investigations part of the game trying to figure out what happened and set things right. Of course you will never fix the problem, because doing so would destroy the premise of the game. But you will be charged with making some galaxy-affecting decisions along the way that are sufficiently at the epic level of a Star Trek story. The good thing about the time crisis plot is that it provides players with access to every Star Trek character from any era, as they are all coming together in the collapsing timeline. And it does seem like each series and movie is represented, including characters from the newest show, Star Trek Discovery. So you might have Subcommander T’Pol from Enterprise on an away mission beside Seven of Nine from Voyager, Scotty from the original Star Trek and even the ever-silent and always drinking Morn from Deep Space Nine. While minor characters like Morn might only have one card that represents them, major characters like Captain Kirk have several including ones that represent all aspects and times of his career as well as several funny cards where they dressed up in costume or put on civilian clothes for a visit to Risa. You play a federation captain assigned to try and unravel the temporal crisis however you want, using whoever you can get to join your crew. 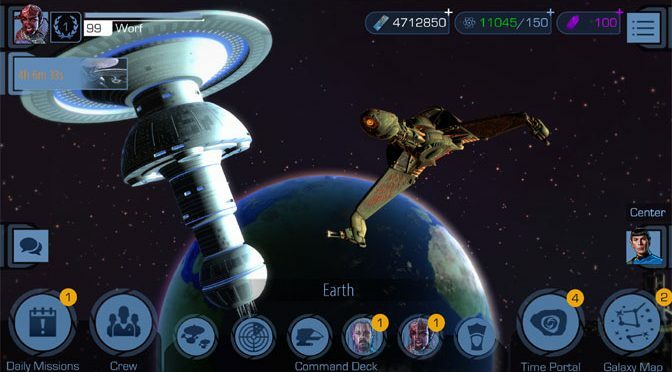 The story mission part of the game involves flying around on a large map of the galaxy to various hot spots, which increase in difficulty as you progress. 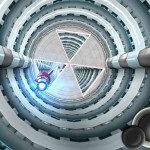 At each location you will be challenged with either an away team mission or a starship combat sequence. 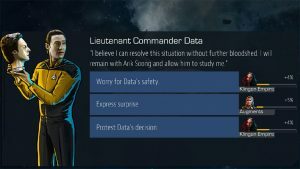 Each member of your crew has one of six skills, Command, Security, Medical, Science, Engineering or Diplomacy. 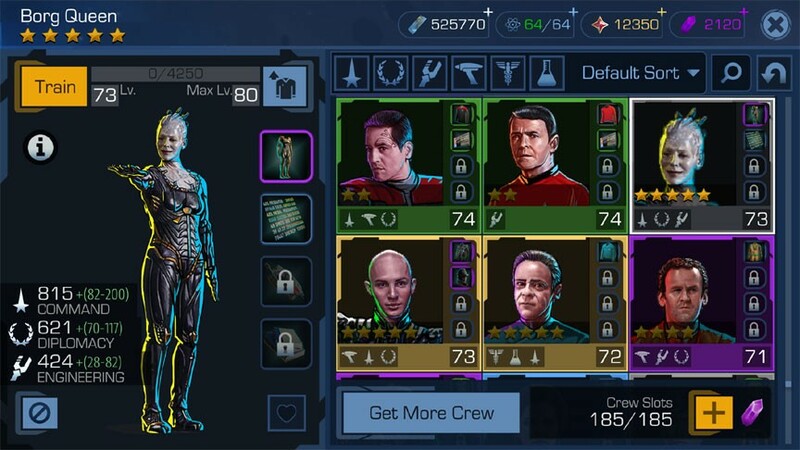 Higher level cards (your crew members) will have multiple skills. You deploy your crew in order to try and match the story challenges. For example, you might be faced with having to disarm an overloaded phaser which has an engineering check of 45, but you could also shoot the phaser to detonate it early with a security check of 35. If you have Scotty and his engineer level is 40, he might be able to do it if he rolls well on a bonus phase. Or you could assign First Officer Saru to shoot it if his security rating is high enough. The trick is having a good balance of crew members sufficiently leveled to be able to handle any task. Crew level up in three ways. First, you can find or make specific items that help them such as a Bajoran Com Badge for Major Kira. Or you can simply use them in missions and they will gain experience and slowly level up. In addition to that, each card (your crew members) will have a certain number of possible stars. When you get each one, only one star will be filled in. However, if you get a duplicate as a mission or random reward, you can merge them together, which fills up a second star. 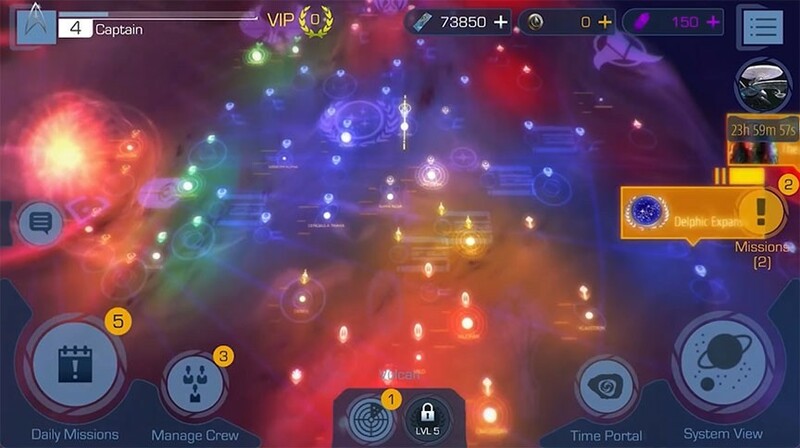 Each star basically multiplies their abilities, so you will want to strive to do that as much as possible, especially for crew with four or five stars, as it will make them extremely powerful at any level. The catch with collecting a crew is that you can only have so many. Currently the limit is 90 unless you spend real money to expand the pool, though 90 is a fairly huge crew. While away missions are strategic, ship to ship combat is done in real time. It reminds me of combat in an MMO, where you tap buttons to activate your ship’s special abilities like firing proton torpedoes or sending over a boarding party. 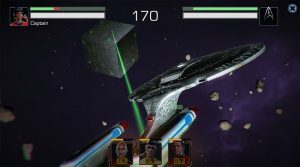 Whatever crew you have assigned to your bridge can also contribute skills, buffing shields or adding to your attack value for example. Abilities have cool down timers, so using them at the right times is important. 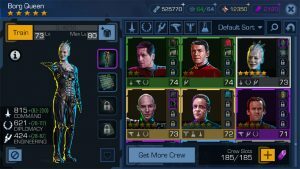 You can collect ships just like crew members, and they also level up and gain power. 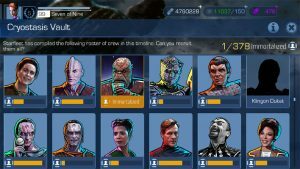 You are not limited to how many ships you can have in your fleet, though leveling them up takes time and is mostly random. 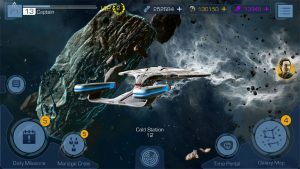 The sound for Star Trek Timelines is amazing. It made my phone sound like a perfect communicator from the Star Trek world. 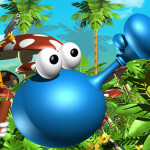 In addition to that, several characters have live voices provided by the actors who played them. They will speak up during combat or whenever you select them, and are quite fun. It really adds a lot to the experience to have the characters respond to your commands with a real voice. Only about 10 percent of the crew have voices, so getting one of them is quite a prize. Graphically, the game looks amazing for a mobile title. The ship to ship battles are especially well rendered. Each of the planets you visit also look great. I don’t have the most powerful Android phone on the market, but it never had a problem rendering those amazing sci-fi worlds. Another good thing about Timelines is that the developers are highly active in the game. Just about every week they sponsor a special event that everyone can participate in regardless of your crew levels. Those events might be based on crafting, away team missions or even ship combat. You never know what a community event will entail, but there are almost always great community rewards. 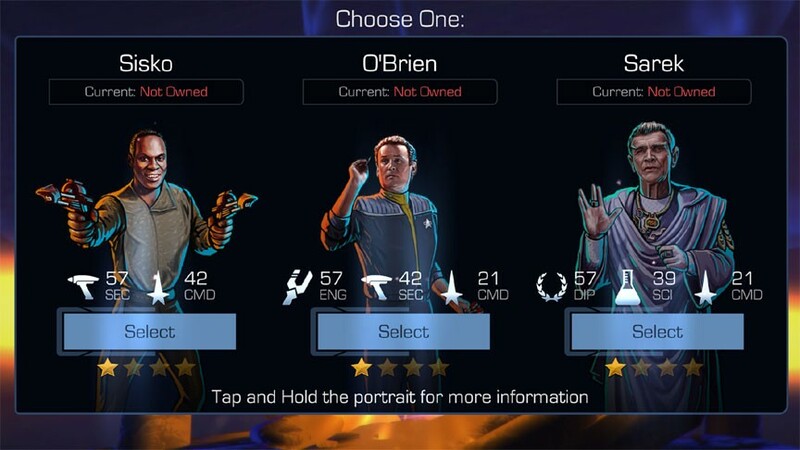 Everyone who participates usually earns a legendary five star or at least a rare four star crew member. You might also earn new ships or rare items that your crew can equip. 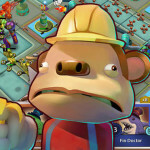 Of course, there is the issue of microtransactions and pay-to-win with any free mobile game. Timelines has that to some extent. Dilithium is the premium currency that is used to do that. It is never offered as part of an event or a story reward, or at least I have never seen it offered. You have to buy it with real money. It can do magic things like leveling crew members, buying more crew slots, purchasing ships and speeding up timers. However, it’s also completely optional. Because you are not really competing with anyone else (the PvP elements in the game are not live and are also fully optional) then not buying Dilithium will not really hinder you. Nobody can attack you or steal your crew or anything like that. Buy it if you want to get powerful really quickly, or just do like I did and enjoy the game by playing it over time and leveling up whenever that naturally happens. 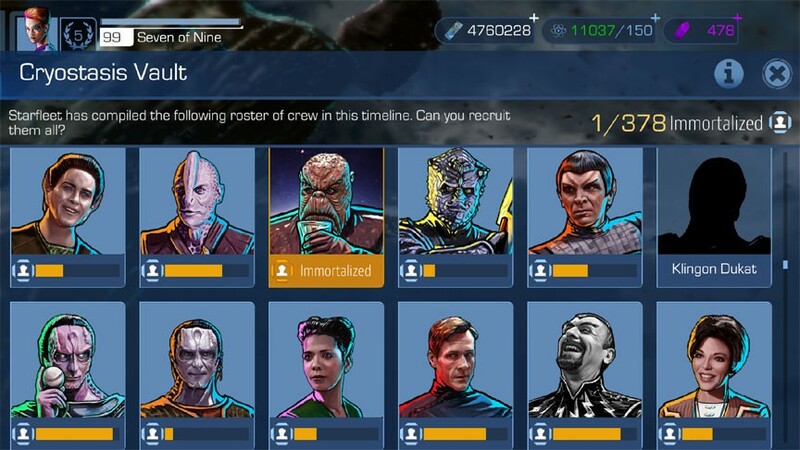 Fans of Star Trek will definitely want to check out Timelines. Playing the game is kind of like meeting old friends, especially those crew members with a real voice. 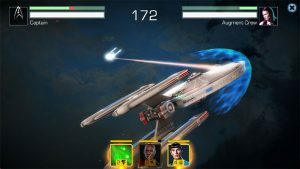 But it’s also a pretty solid sci-fi adventure for mobile even without the Star Trek connection. 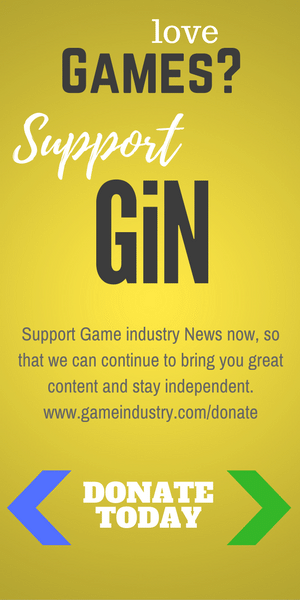 Since the game is free, there is no reason not to check it out to see if it can make your next boring commute (assuming you are not driving), family trip or rainy day a bit more exciting. 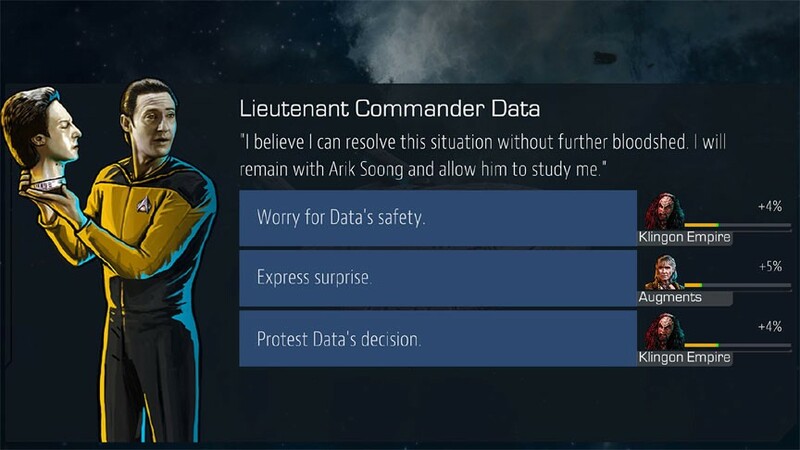 Honestly, I now want to play it because it features Data holding his own head.